Disclaimer: The topics discussed use high voltage and heat. They can cause property damage as well as hurt and kill. This site and author have made this information public for educational purposes only. Anyone who reads this and attempts to make a device based on any part of it does so at his/her own risk. This is disavows any responsibility, and does not encourage anyone to do this. 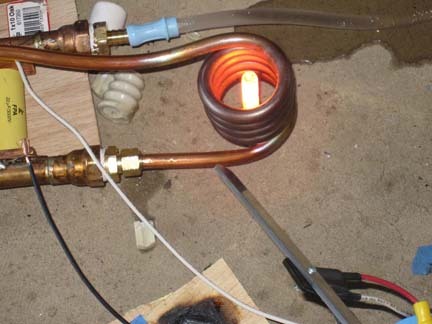 An induction heater is an interesting device, allowing one to rapidly heat a metal object. With enough power, one can even melt metal. 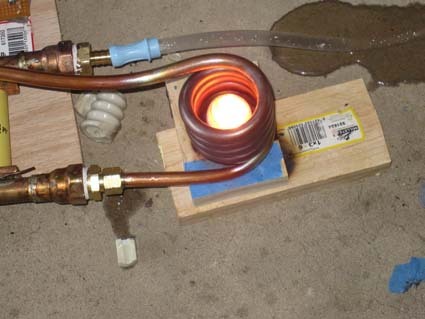 The induction heater works without the need for fossil fuels, and can anneal and heat objects of various shapes. I set out to make an induction heater that could melt steel and aluminum. So far I have been able to feed an input power of over 3 kilowatts! Now that I have done this I would like to share how it works, and how you can build one. At the end of the tutorial I will discuss and show you how to build a levitation coil that will allow you to boil metals while suspended in mid air! The first part of this tutorial will go through my development of a 3kw inverter. My initial goal was to rapidly heat metals. My next goal was to levitate metals. I succeeded, but realized that I could not levitate solid copper and steel. Their density was too great for the magnetic field. This was my final goal: to levitate and suspend molten copper and steel. At the end of this tutorial I will go into the development of a 10kw unit that realized this goal. I will also elaborate on the problems that had to be overcome in order to achieve this. My induction heater is an inverter. 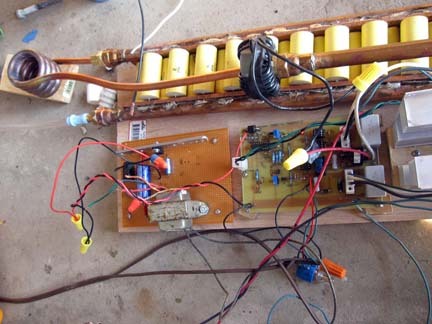 An inverter takes a DC power source and converts it into AC power. The AC power drives a transformer which is coupled to a series LC tank. The inverter frequency is set to the tank's resonant frequency, allowing the generation of very high currents within the tank's coil. The coil is coupled to the workpiece and sets up eddy currents. These currents, traveling through a conductive, but slightly resistive workpiece, heat the piece. Remember, Power = Heat = R*I^2. The workpiece is like a one-turn coil; the work coils has several turns. Thus, we have a step-down transformer, so even higher currents are generated in the workpiece. What I will now do is go over each part. Then, I will give the schematics, go over them and how you can build this device.